In a raid conducted by Israeli Police forces early Monday morning, 22 Charedim were arrested on suspicion of sexual crimes against women and children over the past two years. The suspects had undergone internal proceedings conducted by a Charedi organization called “Tohar Hamachane” (also known as the Tznius police), who ‘treat’ the offenders but do not alert the police or child protective services. The police raided the 22 Charedi residents of Jerusalem, Bnei Brak, and Beitar Illit with a search and arrest warrant based on an investigation. The investigation was launched after the police seized notebooks from Tohar Hamachane which included lists of victims and their crimes. Tohar Hamachane is a central body which works together with various faction leaders of the communities. The suspects were arrested on suspicions of sexual offenses against women, minors and small children. The victims received no treatment by the Charedi authorities, according to police investigators. During the arrest, surrounding Charedim mobilized in attempt to disrupt the police, shouting slurs and hurling stones and objects, which broke two windows of the police vehicles. The suspects were not subjected to any punishment by the internal Charedi authorities, instead being allowed psychological and psychiatric treatment towards rehabilitation. 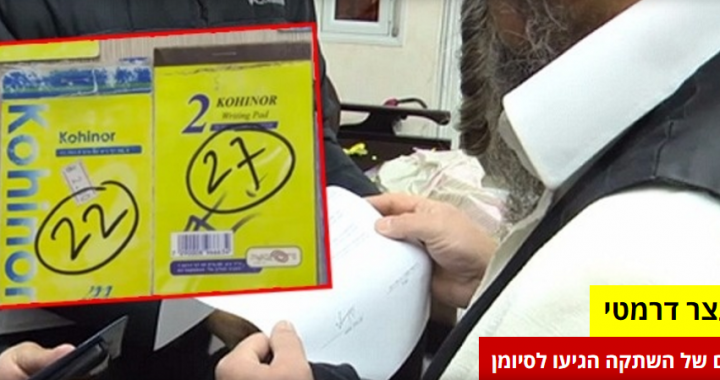 The Charedi faction leaders submit offenders in their congregations to the Charedi authorities in exchange for said authorities agreeing not to report the crimes to the police. According to an army radio report, there are over 100 known victims and some of the suspects have already confessed to the police. This story is based on a YNet Report and reports from other news organizations.